Two years ago, David Hamric made a gutsy career move. He quit his engineering position at Thermo Fisher Scientific in Franklin and started his own business based on his unusual hobby - collecting elements. Yes, elements, as in, tungsten, or selenium, or, of course, gold. He began the hobby as a child. While other kids were swapping baseball cards in seventh grade, young Dave developed an interest in science - especially chemistry, metals, and the periodic table of elements. "I was fascinated when I learned that everything in the universe can be reduced to about 100 fundamental elements," Hamric, 45, said from his home in Walpole. "So I began collecting as many of them as I could." Many of the 20 samples he collected came from local flea markets - lead from fishing weights, unusual copper fragments from disassembling electronic equipment, and selenium from electronic rectifiers. He also wrestled the tungsten from light-bulb filaments, removed tin from solder, and even extracted bromine - a highly toxic and corrosive brown, liquid element - from sodium bromide, a compound similar to table salt. It was always a little frustrating though, Hamric said, because many rare elements were virtually impossible for the average person - not to mention a 12-year-old - to acquire. Years later, along came eBay with online sellers around the world. Suddenly, prized elements that Hamric had only dreamed of adding to his collection were within his reach. 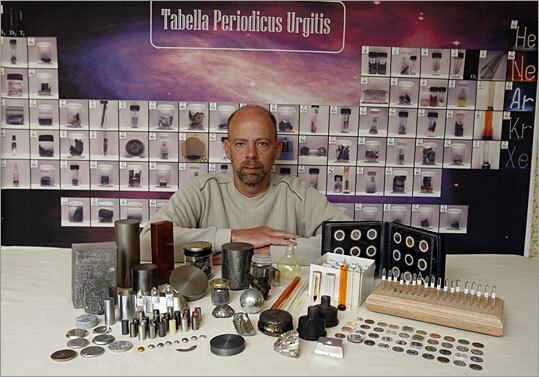 By 2002, his hobby was blooming as ruthenium, rhodium, indium, and dozens of other little-known exotic metals found their way into his growing collection. And soon, Hamric was selling his extra samples on eBay. Thus, the hobby gradually expanded into an unusual business, Metallium Inc. Today, Hamric's personal collection stands at about 150 pieces made up from 82 different elements. While there are still a few elements impossible for Hamric to obtain, due to their low natural abundance or radioactive nature, within the small but enthusiastic element-collecting community, he is highly regarded. Many museums, schools, and colleges are among his 2,000 clients. Learning how to cut, shape, melt, and cast metals - each with its unique properties - was no easy task. And some, because of their toxic or highly reactive nature, require careful handing and an intimate knowledge of federal regulations for shipping hazardous materials. "Perhaps the biggest thing that people need to understand," advises fellow collector Justin Urgitis from Uncasville, Conn., "is that you can't just go into this willy-nilly and collect all these elements. Some are very dangerous if not handled properly and safely secured." Tom Vales works in the Electrical Engineering Department at Suffolk University and is a longtime collector of science artifacts, including elements. Several of his samples were obtained from Hamric. His most recent purchase is rhodium, the rare, expensive metal used in jewelry and as a catalyst in industrial processes. It sells for more than $9,000 an ounce. Another element spiraling in price is indium, a silvery-white metal that is popular with collectors because of its softness - it can be scratched with a fingernail. Seven years ago, a pound of indium cost around $40. Today, it fetches more than 10 times that amount. Both price and production have soared as indium found a new use in the manufacture of light-emitting diodes for flat-screen TVs. Hamric's offerings include customized elements sets - one is about to go on display at the Sterling Hill Mining Museum in northwestern New Jersey - as well as kits popular with educators. One is his element coin series. So far, he has 44 element coins, each about the size of a penny, stamped with information about the element and a small version of the periodic table. The coins range in price from $4 for aluminum to $270 for platinum. Theodore Gray, a writer for Popular Mechanics, has all of Hamric's coins in a huge, personal collection of some 1,400 element samples crammed into his Champaign, Ill., office. "Dave's coins are unique," Gray said. "No one has ever tried striking coins out of such a difficult range of metals. A hundred years from now, people will look at these sets and wonder what on earth possessed someone to go to that much trouble." But for someone with a lifelong passion for science and the elements, it's probably worth the effort. "When I was a teenager, I'd look at the periodic table and wonder what all these elements actually looked like. Now I know."